You may be shocked to learn that the latest Eli Roth joint doesn’t feature torture, cannibalism, or any instances of nauseating horror. “Can something even be an Eli Roth movie without gratuitous gore and sexualized violence?,” you ask. Apparently, yes! 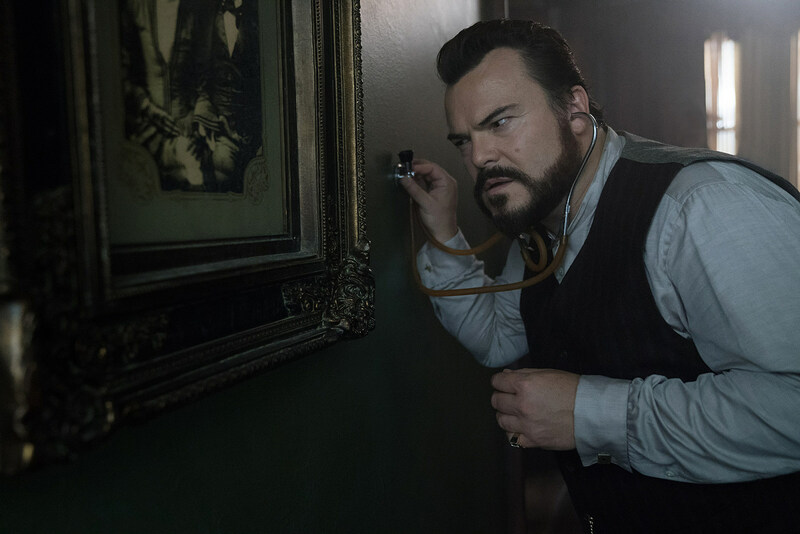 The director best known for his savage brand of horror and the Hostel franchise has gone and made a movie for kids, and while The House With a Clock In Its Walls is entirely safe to take your children to see, it’s also a little too safe and uninspired. Roth’s PG-rated movie — I know, what a concept — is like A Series of Unfortunate Events meets Goosebumps and Harry Potter, only without bringing anything new or surprising to its witchy, haunted house narrative. Based on John Bellairs’ 1973 YA mystery novel, the first in a series of 12 books, The House With a Clock in Its Walls follows a young orphan who moves in with his uncle in 1955. Lewis Barnavelt (Owen Vaccaro, who’s like Young Sheldon crossed with Jacob Tremblay, with the other The Book of Henry kid’s goggles) is a precocious 4th grader who seeks guidance from dictionaries and a Magic 8-Ball. After the death of his parents, Lewis heads to the fictional Michigan town of New Zebedee to meet his kooky uncle, Jonathan Barnavelt (Jack Black), who lives in a magical mansion. While Jonathan attempts to hide his magic from his nephew, he soon reveals he’s a warlock, that his best friend and neighbor, Florence Zimmerman (a silver-haired, purple-clad Cate Blanchett), is a powerful witch with a tragic past, and the house is enchanted. There’s some spooky goings-on around the house — a stained glass window animates ominous portraits, an affectionate armchair zips across the rooms, and old creepy carnival attractions straight out of Goosebumps are stored in the basement — but Roth never transforms the house into the character it should be. It’s just the decorative location that has — you guessed it! — a clock, in its walls. There’s a whole backstory behind the clock involving Kyle MacLachlan’s powerful warlock, the demon Azazel, military PTSD, and a key made out of bones. It’s a little more complicated than necessary, but the gist is that Jonathan, Florence, and Lewis, who begins practicing magic, have to stop the clock before time runs out and destroys the universe. Roth proves he’s indeed capable of making a horror movie free of his usual gruesome thrills, just not a very good or scary one. Here he’s turned down the scare-factor to tepid lows, and without his usual gross-out gimmicks, he can’t ratchet up any tension. Steven Spielberg, whose Amblin Entertainment is behind the film, supposedly gave Roth one tip: to make his kids movie scary. Apparently Roth didn’t listen, because there’s not a genuine spook in the movie; not even some fun jump scares. 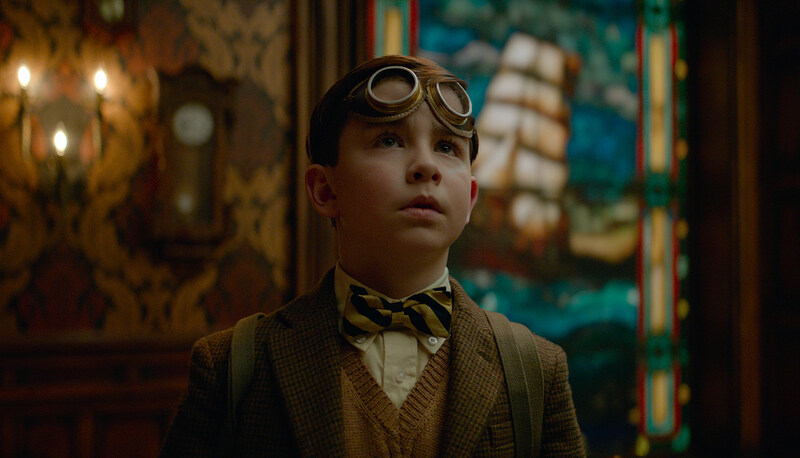 Roth and Amblin may have been aiming to make The House With a Clock In Its Walls a return to the Spielberg classics of the ’80s, but it’s missing the sense of adventure, memorable characters, and the imagination that made movies like E.T. and The Goonies so beloved. Roth does bring some unique visuals to a few set pieces, including an attack by evil jack-o-lanterns, a sequence among the stars, and old-timey flashbacks of Black and MacLachlan’s magician past via a nickelodeon (honestly, I’m more interested in a movie about the latter). Beyond that, the rest of the film recalls other fantasy movies — you can’t help but think of Hocus Pocus during one jaunt through a graveyard with an evil spell book, and a flock of flying novels is ripped right out of the first Harry Potter‘s winged keys sequence. In place of scares, there’s a surplus of playful humor intended for a very young audience — one running gag involves a topiary lion farting gusts of brown leaves. There’s also some banter between Black and Blanchett, the only two giving the movie a pulse. Black’s always fun to watch when he’s at his goofiest, but here his Jonathan is more muted and solemn than the kookier Black you may be expecting. Blanchett, unsurprisingly, lends the film its best moments when she uses an umbrella like a machine gun, and head-butts a pumpkin before promptly cartwheeling out of a river of pumpkin goo like a boss. The most magical thing about this movie is how Blanchett, always giving 100 percent no matter the material, can deliver the most banal dialogue with such gravitas it almost fools you into thinking, if just for a split second, you’re watching a high-quality drama. The House With a Clock In Its Walls is a derivative, if harmless, family-friendly horror movie. At the very least, young audiences may find it entertaining and respond to the whiff of a message about embracing your inner weirdo. But don’t kids deserve more than a hodgepodge of recycled ideas? Since seeing it, I can’t help but wonder what a version directed by Guillermo del Toro would look like, an expert horror filmmaker who can also uniquely relate to kids of traumatized childhoods — just imagine how awesome a PG-version of Crimson Peak would be. I’ve never enjoyed any of Roth’s grisly R-rated movies, but at least those had a distinct vision and style. If only his kid-friendly haunted house movie was as original, it could’ve been a surprising treat.